In 2011 the team found they wanted the ability to take full advantage of the power of the motors in the drive train both while going straight and while turning. To achieve this the team designed a robot with steerable wheels. The 2011 design had front and rear wheels on each side driven from one motor and steered by another motor. This worked but again the losses in the drive train slowed the robot and the team really wanted to have a crab drive as well as a snake drive. This resulted in the 2013 design where we had four independently steerable wheel and 2 drive motors. During the 2013 season we had significant reliability problems and during the off season those areas were addressed. The result is the 2014 drive train which to date has a drive time equivalent to 5 or 6 regionals with no failures. 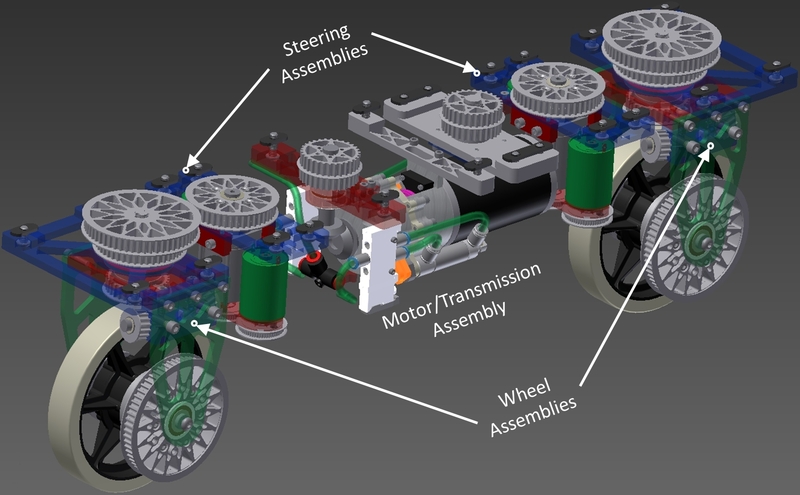 This top view of the completed assembly show the belts and pulleys used to transfer power and steering to the wheels. This side view shows how the assembly fits on the robot – it becomes nearly invisible when complete – especially after the bumpers get attached.